Dremel has been making rotary tools since 1934. They’ve released numerous models over the years, ranging from the older corded models to the newer cordless rotary tools. They also produce power saws, oscillating tools, and others. Dremel is a subsidiary of Bosch tools. 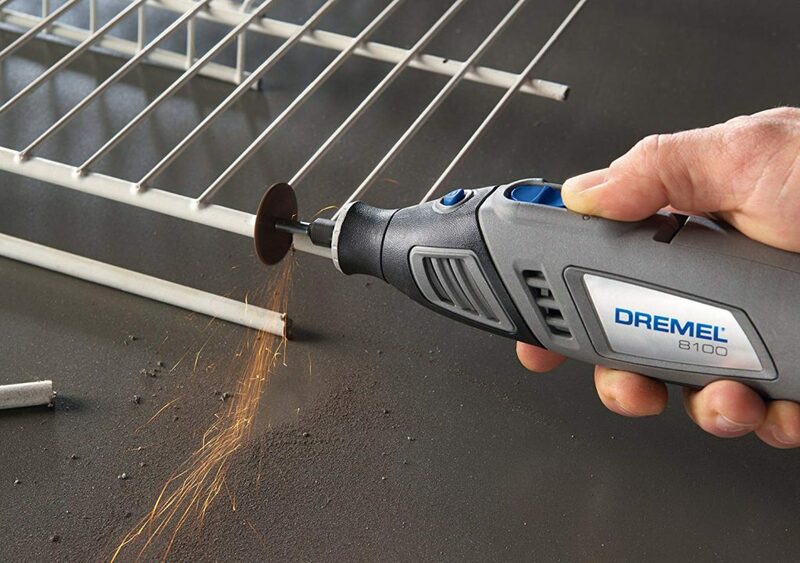 The Dremel brand is trusted by DIYers and construction workers alike for doing home projects or onsite jobs. Dremel cordless rotary tool kits have a place with many hobbyists, animal groomers/vets, constructions workers, DIYers, and homeowners. This particular model, the Dremel 8100n21, is meant for home use more than for professional contractors, although it’s popular for a lot of small cuts and fine detail work. This buyers guide will help you decide if the 8100 is the best choice, or if you should move up to the newer Dremel 8220. 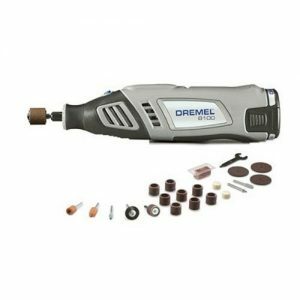 The Dremel 8100 is a multi-purpose cordless tool for construction, animal grooming, hobbyists, woodworking, and other applications. It doesn’t have the same level of torque as corded models, but it has enough of a punch to work well for most smaller jobs. With variable speeds stepped from 5,000 to 33,000 RPMs, you can get the proper speed to do what you need to do. Compared to other rotary tools, this Dremel operates quietly. For animal nail trimming and indoor use in noise-sensitive areas (apartments, townhouses, businesses, etc.) it’s quiet enough not to cause a disturbance. You’ll be able to maneuver this tool around fairly easily. Even with the 8v lithiumion battery installed, it only weighs about 15 ounces. It’s 8.5 inches long, 2 inches tall, and 2.5 inches wide, which is small enough for easier handling. The comfort grip housing makes this tool more comfortable and offers better tool control during long hours of detailed work. The 8100 is a cordless model, as opposed to the brand’s many corded rotary tools they’ve offered in the past. It has a high capacity 8 volt lithium ion battery to keep it working up to around 8 hours of run time when fully charged. You will receive a fast charger for the included battery in the kit, which can fully charge the battery in one hour. Compatibility has been an issue for some particularly popular rotary tool accessories. However, Dremel does offer adaptors for some of these accessories, including an adaptor for the 225 flex shaft. Some adaptors come with the standard rotary tool kit. It can also be used with the Dremel workstation. A number of extra bits, heads, and adaptors come with it. Although the Dremel keyless chuck doesn’t mention being compatible with the 8100, people have mentioned it working anyway. It’s worth noting that this model of Dremel doesn’t operate in reverse. You can only use it for one direction of spin. While this can pose a minor inconvenience in some situations, it’s not likely to bother you most of the time. Because of the simple controls (on/off, power adjustment), it’s easy for beginners to pick up and use right away. Tips are also easy to swap using the twist-off nose cap. You don’t need a wrench to change attachments and tips or to add accessories. When you purchase the Dremel 8100 tool, you get a limited 2 year warranty. Customer service has excellent response time if you do face any issues. Dremel stands behind their products and will usually replace or swap out your tool if you’re not satisfied with it or if it breaks. If you do have an issue or a question, they can be reached at 1-800-437-3635. If you’re looking for a smaller tool to do simple jobs like trimming dog’s nails, cutting sheet metal, engraving wood, or polishing metal, it does the trick. For heavy work, you may want more voltage or a corded model with higher amperage. Four attachments are included with the Dremel 8100-N as a combo kit when you buy it. The rotary tool is also compatible with most other Dremel accessories and attachments, with the exception of the 231, 335, PL400, and MS400 attachments. For cutting a variety of thin surfaces, you’ll get 3 different cut-off wheels. These cut wheels an be used on plastic, metal, wood, and glass, although they do not have a guider to facilitate glass cutting. For grinding and sharpening, there are 3 different grinding stone attachments in various shapes. One is made from silicon carbide while the other 2 are aluminum oxide grinding wheels. To carve or engrave, you can use the silicon carbide attachment and the cutting heads. No specific engraving head attachment is included. To polish or clean, you can use the felt polishing wheel or bristle brush. There are 4 different options for sanding, all in various sizes and with varying roughness. You can use 1 of 3 different sanding bands or the sanding drum mandrel. Along with the attachments, you’ll get a hard plastic storage case, a bar polishing compound, 2 shank mandrels, a bit wrench, an EZ twist nose cap, battery pack and a charger. How does the 8100 max cordless rotary tool compare to other Dremel brand power tools? There are a lot of options that have been produced over the years, but the most important comparisons are against similar units from Dremel. When you need a rotary tool is a bit more power, the 4000 does offer that benefit. Because it’s a corded electric tool, it has more torque than the 8100. 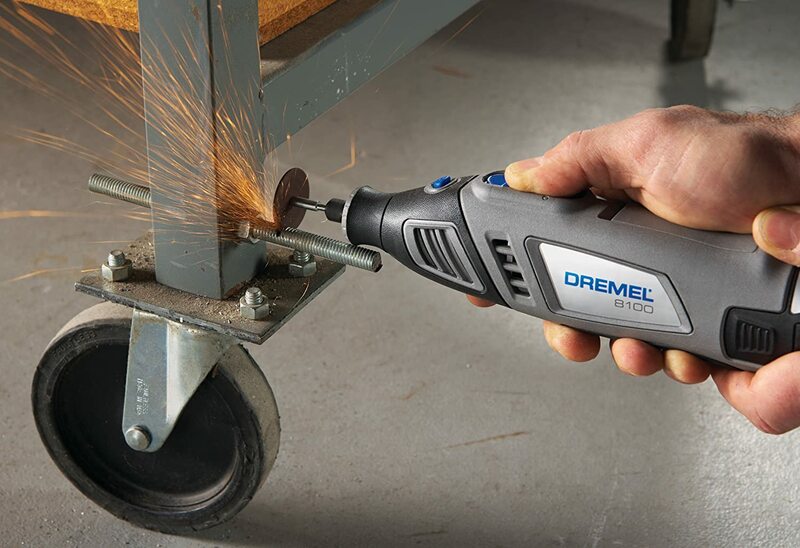 The Dremel 4000 has 1.6 amps of power, which auto adjusts depending on what you’re doing. You can still manually adjust the speed as needed too. One of the obvious disadvantages of the 4000 series rotary tools is that you’re stuck tethered to an electrical outlet. The cord is 6 feet long, which is great for a work space but not ideal if you’re working on pets or if you need to move around to use the tool in different locations. It’s quicker to set up the 8100 and get working on the job, and you’ll be able to use it anywhere. However, being plugged in does provide more power. The 4000 does have variable speed control between 5,000 and 35,000 RPMs compared to the 8100’s 5,000 to 33,000 RPMs. Unless you’re doing serious cuts through thick or hard materials, you may not notice that difference most of the time. The 4000 is a good tool for cutting glass. I also review the Dremel 3000 vs 4000 on this site. These are two similar cordless handheld units. The largest difference between the two is that the 8220 is a 12 volt tool while the 8100 is 8 volts. What this looks like in use is that the 8220 has more power than the 8100. You wouldn’t notice the difference for small work, but if you’re cutting hard materials or getting any depth in your cuts, the 8100 might have some trouble where the 8220 won’t. The other major difference is in compatibility and purchasing options. The 8220 is compatible with a wider range of Dremel tool attachments and accessories than the 8100, so you can find larger accessory kits paired with the 8220. Lastly, the 8100 does not have a separate on/off speed control, where the 8220 does. You may not be bothered by this little difference, but it’s worth mentioning for those who are. When you need a stronger tool with a little added torque, the 8220 is something to look at. However, for most everyday use and especially for use with animals, the 8100 is a good option. The Dremel 8050 is an older model of the cordless dremel. Looking at the Dremel 8100 vs 8050, you’ll notice a few major difference immediately. While the 8100’s speed range is from 5,000 to 33,000 RPMs, the 8050 can only go up to 28,000 RPMs. They’re both 8 volt cordless devices with similar battery life. When you’re using the 8100, you can replace attachments in seconds with the twisting nose cap. For the 8050, you need a wrench to remove the attachments and put on new ones. One convenient feature in the 8050 that isn’t present in the 8100 is the front-end LED light to help you see what you’re doing in all working conditions. To fully charge the 8050, you need to have it charging for 3 hours and 45 minutes versus the short 1 hour charge for the 8100. 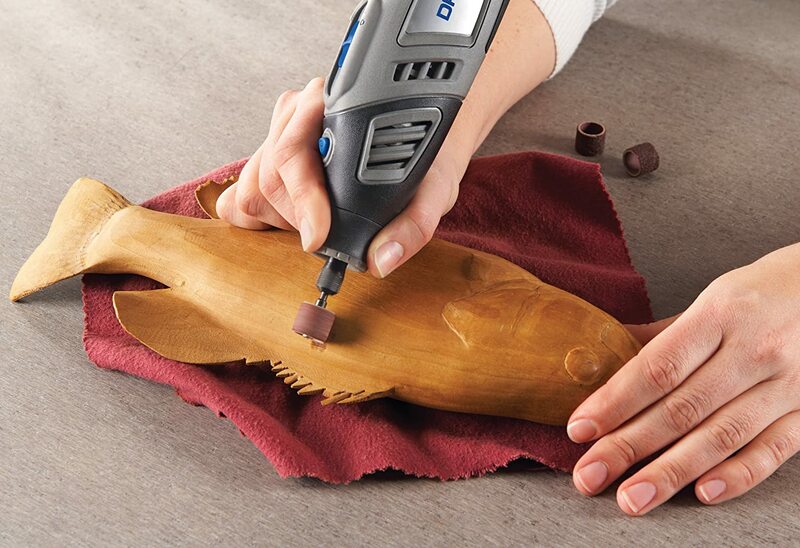 The Dremel 8100 is a well-rounded hand tool for everyday use. It’s stronger than some of the other handheld versions, though there are some corded models with a little more power. However, this one is quiet, strong enough for most tasks you would need a rotary tool for, works well with the available accessories, and has a great battery life with rapid recharge. I prefer the the corded versions for intense all-day use, but for doing tasks “on the job”, I would go with this one or even upgrade to the 8220.